As an Associate Professor in Learning and Teaching, my role is to support colleagues in implementing key policies and strategies related to learning, teaching and assessment. I work with people from all across the University as well as acting as a point of contact between the Centre for Excellence in Learning and Teaching and two of the University’s Colleges (Life and Natural Sciences; and Arts, Humanities and Education). Ultimately, my job is about helping to ensure that our students have the best opportunities possible to meet their potential. Part of my work involves leading Derby’s Pathfinder scheme. 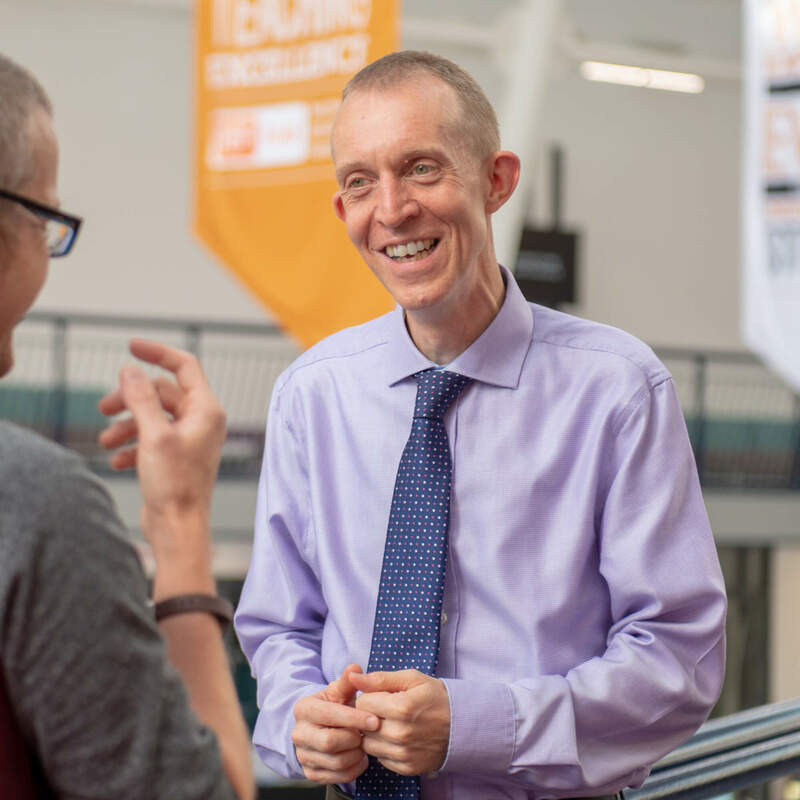 Pathfinder provides an opportunity for all Derby staff who teach or support the learning experience of our students to gain fellowship of AdvanceHE, which is a qualification that recognises their skills and experience. My Associate Professor role is not primarily a teaching one. However, I do lead Continuing Professional Development workshops and, in coordinating the Pathfinder scheme, I work closely with colleagues in small groups or on a one-to-one basis. For the majority of my career prior to joining the University of Derby in 2018, I was a Lecturer in Geography. I have a longstanding interest in the processes of learning, teaching and assessment and this is reflected in my past and present research. I have led and collaborated with others on projects exploring different dimensions of the student experience, focusing on both discipline-specific pedagogies (eg fieldwork) as well more generic topics (eg induction and the transition to university, employability, and the use of scenarios to support ethical thinking skills). A number of projects have involved aspects of technology-enhanced learning (eg the role of social networking tools, student-authored podcasts, audio feedback). I have a strong personal and professional interest in sustainable development and this has also been reflected in my research (eg assessing the carbon footprint of fieldwork). I have spoken about different aspects of learning and teaching, often in collaboration with research colleagues, at a range of recent conferences and workshops including at the Universities of Aston, Bangor, Salford, Glasgow Caledonian, Cumbria, Portsmouth and Plymouth. Ribchester, C. and Healey, R. (forthcoming) Realism, reflection and responsibility: the challenge of writing effective scenarios to support the development of ethical thinking skills. Journal of Further and Higher Education. The Realism, reflection and responsibility article is available online. Ribchester, C. and Healey, R. (2016) Developing Ethical Geography Students? The impact and effectiveness of a tutorial based approach. Journal of Geography in Higher Education. 40: 302-319. Ribchester, C., Ross, K and Rees, E. (2014) Examining the Impact of Pre-induction Social Networking on the Student Transition into Higher Education. Innovations in Education & Teaching International. 51, 355-365. Ribchester, C., Wakefield, K and Miller, G. (2012) Creating a Transitional Space for New Students through Pre-induction Social Networking. Journal of Geography in Higher Education. 36, 455-467. Ribchester, C. (2012) The carbon footprint of fieldwork. In R. Phillips and J. Johns (Eds. ), Fieldwork for Human Geography (pp. 18-21). London: Sage. Ribchester, C., Hunt, T. and Alexander, R. (2009) “How big’s your engine, mate?” Encouraging active participation in ESD by assessing the carbon footprint of field work. Planet 22, 27-33. Ribchester, C. and France, D. (2008) Podcasts and feedback. In G. Salmon and P. Edirisingha (Eds. ), Podcasting for Learning in Universities (pp. 70-79). Maidenhead: Open University Press. Ribchester, C., Wakefield, K. and France, D. (2008) The Chester Graduate/Undergraduate Employability Conference and Employability Strategy. Planet. 21, 33-36. Ribchester, C., France, D. and Wheeler, A. (2008) Podcasting: A tool for enhancing assessment feedback? In E. O’Doherty (Ed. ), The Fourth Education in a Changing Environment Conference Book 2007 (pp.119-136). Santa Rosa: Informing Science Press. Ribchester, C., Lipscombe, B., Burek, C., Degg, M. and Potter, J. (2008) An Overview of Extra-curricular Education for Sustainable Development (ESD) Interventions in UK Universities. International Journal of Sustainability in Higher Education. 9, 222-234.